The Firestone Affinity Touring tire offers up a smoother ride and longer lasting tread life than many competitor tires in its class. Utilizing some of the latest in tire technology, Firestone has tried to give luxury car owners good performance and handling, along with a more comfortable ride. The tire itself sports Computer Optimized Component System (COCS) which optimizes not only the tread design, but the entire process of shaping the casing and constructing the tire. They’ve added a silica enhanced tread compound to give more traction and grip on wet roads. Combine that with diagonal and lateral sipes, and you get a tread design that should take on all types of weather conditions. Inside the tire you’ll find twin steel belts with a polyester cord body for more strength and durability at higher speeds, as well as more even wear and a better overall ride. L.L. Carbon provides a longer tread life on the Affinity Touring. Overall, Firestone has designed a solid touring tire. We only wish it held up better in wet or winter road conditions. If that is not an issue where you live, then this tire may make a good choice. Prices on the Firestone Affinity touring range from around $70 for the 14 inch series to $195+ for the much larger 17 inch tire models. At the end of article is coupon for this tire and here you can find some other coupons. Who Are Firestone Affinity Touring Tires Designed For? 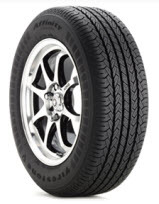 Firestone has developed the Affinity Touring for drivers of higher end luxury coupes and sedans who are looking for all-season handling, yet ride comfortably and provide a good tread life. Firestone Tires warrants the Affinity Touring for 5 years or 50,000 miles. There is also a first 1/32 inch of wear guarantee on the tire’s uniformity. Materials and workmanship are guaranteed for 5 years and includes free tire replacement during the first 3 years. This is followed up with a prorated warranty for the final time period or until there is 2/32 inch of useable tread life left. You’ll also get Firestone’s 30 day buy and try guarantee which provides you the opportunity to refund or exchange the tire with another Firestone brand.